Tomorrow I turn 43 and am grateful that I am beginning to grasp the natural rhythms of my own body and soul. Our lives are so cyclical, attached to days, months, seasons, waxing and waning of the moon. I feel I am learning to move to this rhythmic cycle in a gentle and graceful way. I see this cycle mirrored in relationships, in events, in synchronicities, in dance. This weekend we cozied up by the fire pit mesmerized by the flames licking across the wood, the small starter flame eagerly growing and consuming. Then comes the glow of embers, a smaller movement, entrancing. I’ve studied this dance a thousand times before, this time stopping the flames mid-rhythm by rescuing several pieces of char before they crumbled to ash. I love this piece and I immediately began to sing, “Refiner’s fire… my hearts one desire is to be holy… set apart. What a beautifully written post, wonderful imagery. Blessings to you on this your birthday. Celebrate big! Beautifully said and wonderful piece. 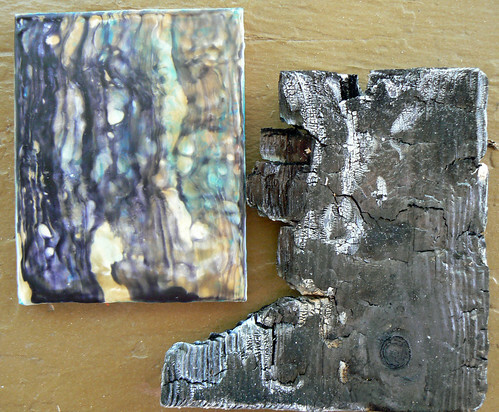 I’ve not given encaustics a try yet but am intrigued by the process and the beautiful art others are producing. Hope you had a wonderful b-day! Happy Birthday Amanda and thanks for the wisdom you’ve shared – along with the beautiful piece of art that you created!